The camp proved to be just that: intense training and lots of fun. Our instructors this weekend were Shihan Brad and Sensei Dean who put us through our paces and generously imparted their knowledge & experience throughout the weekend. The first class on Friday included a warmup that involved running & punching combinations, and then it was straight into kihon lead by Shihan Brad that incorporated the 30 basic techniques that are commonly used in Kyokushin karate (19 hand techniques and 11 kicking techniques), followed by some cool combinations. Later in the evening we had a team competition where we competed in events such as: who has the largest feet, who can jump the highest, complete a jigsaw puzzle the quickest and hold a plank the longest. Our team won & we were rewarded with prizes. Saturday - After a surprisingly ok nights sleep on the dojo floor, we were awakened by a barking dog that enthusiastically greeted everyone in the dojo, and then it was outside into the beautiful morning sunshine to play frisbee games on the grass and this was a wonderful way to get warmed up in preparation for the days training. The Dan candidates then split off from the main class and Shihan Brad patiently went through Kata’s and Kihon in preparation for our upcoming tests. A cool yoga class was given by Sempai Sherry at lunch time that helped to rejuvenate us in preparation for an afternoon that finished up with a very sweaty and exhausting one hour of pad work under the instruction of Sensei Dean. The food throughout the weekend was excellent and plentiful, and a big thankyou to Sempai Michelle and others for their incredible work. I would like to thank the Shihan Brad and Sensei Dean for donating their time to instruct us in Kyokushin karate - they did an amazing job. And also, a big thankyou to Sempai Dennis from Calgary who took great care of the Edmonton participants. I look forward to seeing everyone again soon. OSU! 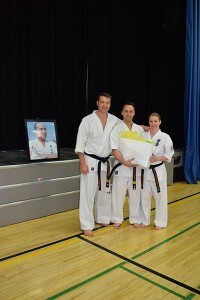 Calgary Kyokushin spring camp; what a hidden little secret! This was my first time to the camp and I wish I had come sooner. It was taught by two excellent experienced instructors: Shihan Brad Gillespie and Sensei Dean Bawtinheimer. This camp is exactly what I needed in order to prepare for my upcoming nidan exam. Thanks to Shihan Brad Gillespie, I was able to work on some katas under his supervision in a small group with people who had similar goals to. Spending my time running a dojo in Edmonton, having three active kids and a busy professional career does not leave a lot of extra time to focus on my own karate skills. I missed the first class on the Friday but arrived just in time for the 8 am class on Saturday. This class started off with a fun warm up game that I am sure that the students in Edmonton will love. Seeing how Shihan Brad and Sensei Dean taught their classes was excellent professional development for me in my own instructing. The food and meal preparation was excellent. The work with the food was led by Sempai Michelle Gillespie. She had an excellent team of volunteers who always had food ready. One thing I can definitely attest to is never being hungry. I believe I ate $110 (the cost of the camp) worth of food that weekend by myself. There were always snacks on hand, which I needed after the last class on Saturday with Sensei Dean. I was exhausted after the kicking drills that he led and I needed some quick nourishment. Many thanks to Craig and Robin who generously offered the use of a shower at their home for both myself and Sempai Damon. Much needed after the hard training. After the shower, the camp organized a social gathering for the families. On one side of the gym kids watched a movie and on the other side the adults socialized. I found that I was too exhausted to be to outgoing that night but of course the saturday night supper was excellent. As Shihan Brad had said, “Taco in a bag; fire hall special”. I had the pleasure of training at the Calgary Kyokushin Karate Spring Training camp over the weekend of May 26 to 28, 2017. Myself and 1 of my students attended. I have attended the camp only 1 time prior many years ago. This year, as the last time I attended, Sensei Dean Bawtinheimer was assisting with the training and drills in the camp. Between Sensei Dean and Shihan Brad the variety and intensity of the training was perfect. I found it refreshing to focus on the technical aspects of higher level handbook/belt requirements at an analytical pace. I sincerely appreciated the direct and often 1-1 critiques and corrections of my technique. Conversely, Sensei Dean provided a variety of high intensity drills for basics and fight training that left me satisfyingly exhausted. Additionally, I was able to steal some teaching drills and ideas to bring back to my own dojo which I am always excited to try once I return home (Beware Banff!). It is one of the great benefits of training with different people, at other dojos, and under different instructors. Provided you are comfortable sleeping in the gym (bring ear plugs) the value for this camp is phenomenal. The fee included 6 (maybe 7) training sessions plus two dinners breakfast and lunch. We wrapped up early in the morning on Sunday which left time to assimilate back to normal life and/or commute home. One point sticks out in my mind from our technical practice which I will finish with, regarding blocking in kata. Remember to “Whip it, whip it good”. Thank you Shihan Brad and Sensei Dean for a fantastic weekend and a special shout out to Sempai Dennis Forget and Lisa for the impromptu hospitality on Friday night (which saved me for Saturday). This entry was posted	on Monday, June 5th, 2017 at 5:59 pm	and is filed under Uncategorized. You can follow any responses to this entry through the RSS 2.0 feed. Both comments and pings are currently closed.